The way Americans dress has fundamentally changed in recent years. Once crafted in domestic factories, 98% of our clothing is now made abroad. And stores ranging from fast fashion chains like H&M and Forever 21 and discounters like Target to traditional companies like Gap and Macy's offer the newest trends at unprecedentedly low prices. It's driving up our pace of consumption and turning fashion into one of the most environmentally destructive industries on Earth. And we have little reason to keep wearing much less repairing the clothes we already own when styles change so fast and it’s cheaper to just buy more. In her debut book, Overdressed: The Shockingly High Cost of Cheap Fashion, journalist and former cheap fashion addict Elizabeth L. Cline sets out to uncover the true nature of the cheap fashion juggernaut. What are we doing with all these clothes? And more important, what are they doing to us, our society, our environment, even our souls? The book that ignited a global conscious fashion revolution! Released by Penguin Portfolio in 2012 (paperback in 2013), Overdressed is a landmark investigation into the rise of fast, disposable fashion and its hidden toll on the environment, human rights, and consumer behavior — the first of its kind. Years before the rest of the world woke up to the impacts of fashion, Cline was reporting on the subject. The critically acclaimed title has been hailed hailed by BusinessWeek as “the fashion world’s answer to… The Omnivore’s Dilemma,” declared a “sharp wake-up call” by Publishers Weekly and earned Cline comparisons as the “Michael Pollan of fashion” (Newsweek‘s Michelle Goldberg). Cline was among the first U.S. journalists to cover the fashion industry in Bangladesh, before the 2013 Rana Plaza disaster claimed the lives of 1,130 garment workers. She has shared her research from Overdressed on many prestigious radio and television programs, including Fresh Air With Terry Gross, NPR’s On Point and All Things Considers, NBC Nightly News, BBC The World, WNYC’s The Brian Lehrer Show, and The New York Times Video, among many others. 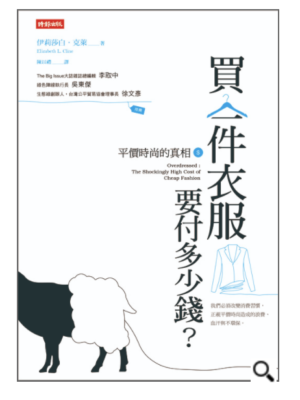 Overdressed has been translated into six languages and has helped to galvanize a global ethical fashion movement, inspired countless ethical fashion brands and startups and is included in the curriculum at universities and high schools around the U.S. and Canada. Continued demand for the book resulted in an audio version in late 2016. An Italian translation with an updated preface was released in April 2018. A follow-up, The Conscious Closet: A Revolutionary Guide to Looking Good While Doing Good, is in the works, with a release date set for late 2019. Elizabeth L. Cline goes for the jugular straight away in this exploration of the consumer love affair with cheap clothing.